In which I issue a warning: Do not be fooled by this book’s adorable cover. Read at your own risk (of boredom). 1. There is no plot. There are a bunch of girls (I could not for the life of me tell you how many, see point 2). They are between 21 and 30 years old. They are not married, but people they know are. They are living in New York or Chicago and they have jobs that they hate. Each chapter consists of a kind of episodic event (or nonevent), mostly to do with boys who they don’t really like that much, but date anyway. This is the whole book. No character progression, no conflict, no resolution. Just stuff. 2. I could not remember which characters were which. In addition to the absence of a plot, there was also an absence of any discernible differences between the characters, which made them just names to me. The very cute cover (I give credit where credit is due, good job designers) is also sadly accurate. 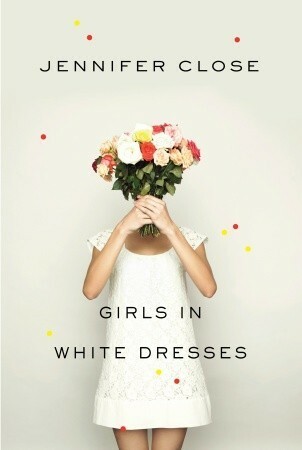 They are faceless girls in white dresses (though they spend less time in weddings than the cover and title might suggest…I think there were two wedding-related scenes total). Because the characters all had basically the same voice and no personality to speak of, I had to basically relearn who each person was at the beginning of their next chapter. I found myself flipping back to their previous sections just to get some kind of context. There’s one girl named Isabella who gets mentioned more than the other ones, so I could generally remember her when she showed up, but I couldn’t quite remember what I knew about her. Where did she live again? What kind of job did she have? Was she the waitress or the publishing assistant? Flat. All flat. Admittedly, I don’t normally read a lot of what we call “chick lit”. Maybe this is what a lot of chick lit is like! I thought I’d give it a try since I was looking for something easy and sweet. I thought, “oh my gosh, I’ve been in a ton of weddings! Maybe I’ll find this funny and relatable.” But I did not. Maybe there’s a reason I don’t read this genre. Maybe my lesson is learned. That’s all I have to say. You have been warned.